For this year’s festival, we wanted to make a special poster to commemorate our fifth year. 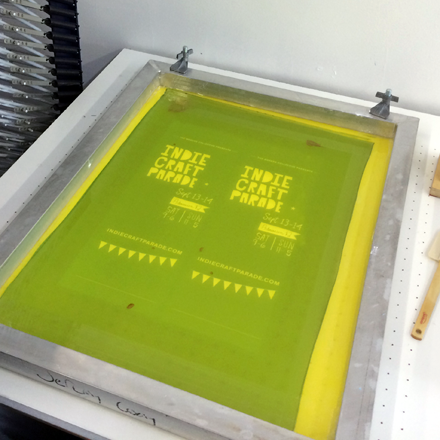 We worked with the folks at The Printshop, Greenville’s newest makerspace, to create silkscreened posters for our event. We spent an evening at The Printshop with Andrew (husband of our co-founder, Lib Ramos) and Jeremy to print our 2014 posters. They walked us through each step of the process — from burning a screen to registering inks and we took pictures along the way. It was so much fun to take our design from a computer screen to a final printed product and be reminded of all the work that goes into screenprinted art. As we often tell others, learning a new skill is one of the best ways to foster appreciation for it. Here are some of our behind the scenes photos. 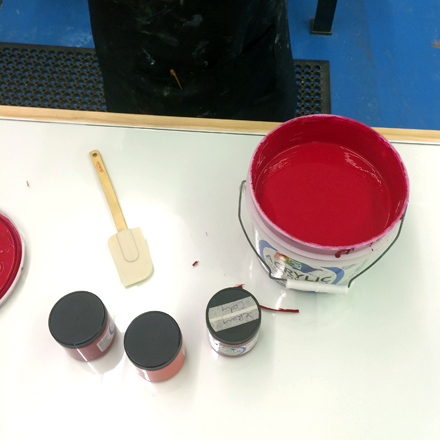 Mixing inks to get the perfect shade. Jeremy shows us how to pull a print. The first color on drying racks. Burnt screen for color number two. Final prints drying in a row. 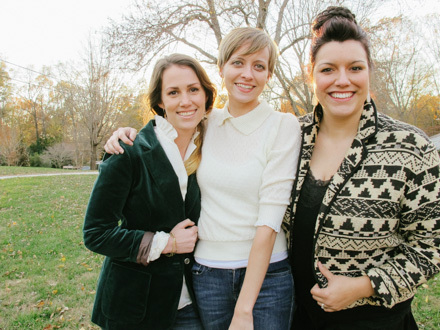 Fun fact: The Printshop founders were introduced at last year's Indie Craft Parade. In less than a year's time, they ran a successfully funded Kickstarter and opened the doors to our city's first community print shop. The Printshop is offering classes along with studio space and access to equipment for all kinds of printing processes like silkscreen, etching, letterpress, lithography and more. Be on the lookout for more partnerships between Indie Craft Parade and The Printshop down the road — for example we're hosting a modern calligraphy workshop in their space mid-January! One tool we frequently use that makes our lives easier also happens to be a company who actively supports creative events across the country like Indie Craft Parade. It’s our friends at MailChimp!We like to seek out sponsors whose services are valuable and relevant to our artists and fans. And we also like to share tools we use to make our organization more efficient. MailChimp is both of those. 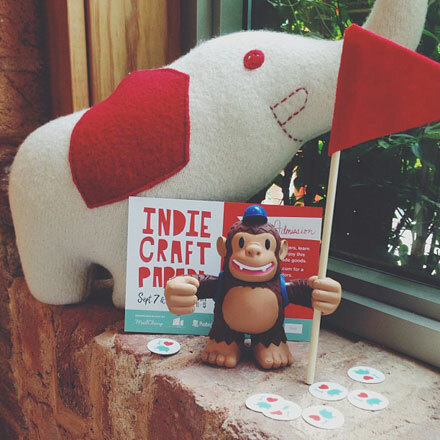 If you receive our Indie Craft Parade or Makers Summit newsletters, then you’ve seen MailChimp in action. (And if you’re not on the list, you can sign up at the bottom of our sites!). MailChimp makes communicating via email so much easier. They also provide a set of great Resources for beginners, whether you're selling items online, a nonprofit like us, or just getting started sending emails. For those already familiar with MailChimp, be sure to look into the many ways you can integrate your MailChimp account with other services you use regularly like Facebook, Twitter and some eCommerce platforms! 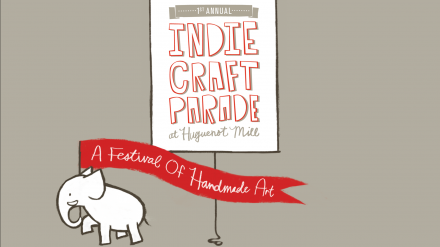 While you're at it, be sure to let MailChimp know you appreciate their support of events like Indie Craft Parade. We're so pleased to announce this year's jury who will be responsible for choosing the 2014 exhibitors for Indie Craft Parade. These people have shaped their artists' communities both at home and abroad, and we know they're going to help us put on a magnificent show. Before presenting the jury, here’s a little insight into the process of how they will choose the participants in our show. When all of the applications are collected, jury members review them by viewing the submitted photos as well as a brief description of the artist's work. This information is presented anonymously to the jury to level the playing field as much as possible. Each category is juried separately, so although applicants may apply in multiple categories (example: a ceramic artist that also makes screen printed tea towels). Artist's work may be accepted in some categories and declined in others. After reviewing the application, each jury member casts a vote for or against, and the application is accepted, declined, or put on a waiting list. In previous years, our jury has met together as a group here in Greenville and curated the show in a single (very long) day. To better accommodate these generous folks and allow for a wider variety of jury members, we are moving our entire jurying process online. Our jury will now be able to review applications and cast their votes electronically. This allows us to select future jury members from a much broader area and ensures that Indie Craft Parade will continue to be fresh every year. 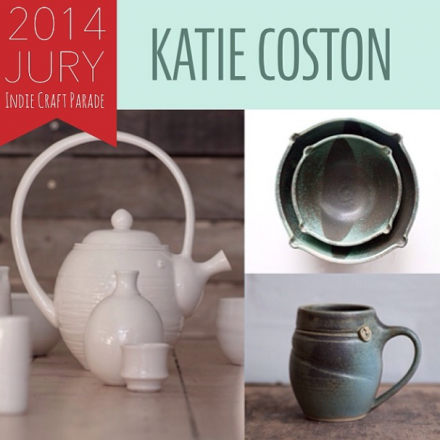 And new to the jury...The Indie Craft Parade team. 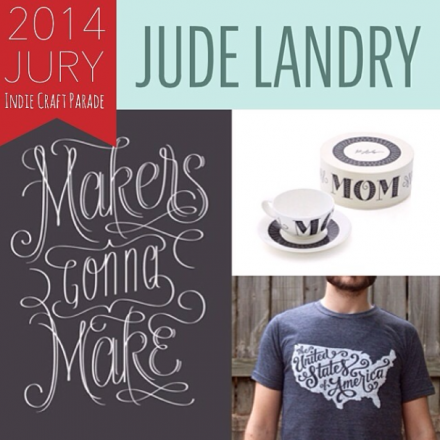 To make sure our vision for Indie Craft Parade never wavers, we've decided to claim a single jury vote for ourselves. Until this year, our main role in curating the festival has been to select the jury and facilitate the jurying day. Five years later, we'd like to weigh in. Of course, our collective vote will not count any more than other jury members. (Sorry to disappoint all of you who applicants who were ready to send bribes.) We still want the choosing of exhibitors to be guided by a panel of artists who we trust. But we do want to make sure our voice is represented as well. So that's how it works. We're so thankful to the jury who takes the time to do a difficult job. All of our amazing applicants don't make their job easy! One of the newest sponsors to join The Makers Summit this year is Big Cartel, another partnership we are really excited about! Big Cartel has been around since 2005, and handles behind the scenes shopping functionality for all kinds of beautiful online shops. One of the biggest benefits Big Cartel offers is the ability to host your shop on your own site, fully customized. They also have very reasonable flat fee pricing, beginning with a free plan that you can try out and see if it works for you and your products. If you're thinking about opening an online shop soon and want to know what options are out there, you'll definitely want to hear our Makers Summit panel about this very topic. We'll have representatives from Big Cartel, Square Market and ScoutMob discussing various methods of selling online, and answering attendee questions about getting the most out of your shop. Another reason that we love Big Cartel is their support of independent artists. Initiatives like their Field Guides help artists tackle issues like copyright, taxes, and making your shop better. These efforts are perfectly in line with our plans for The Makers Summit, so we're excited to join forces and tackle these things together next month. If you haven't already, grab your Makers Summit ticket and come see what else Big Cartel has to offer! MailChimp has been one of our biggest supporters from day one, and we're pretty big fans of theirs as well. They are a sponsor of the 2014 Makers Summit! A few months ago, we finally had the opportunity to visit their Atlanta offices. One of the first things we saw when we walked in was this amazing embroidered front desk! We knew we were in the right place. MailChimp has a reputation of supporting creative and small business ventures like ours. So it seemed fitting that their front desk would be a giant example of craftsmanship. We got to explore the offices with our friend Marco, and meet a few of the people that make MailChimp tick. We were especially impressed by the 3D printer station for employees! MailChimp for Online Sellers MailChimp for NonprofitsMailChimp for Bloggers and even, a coloring book for kids! We know you'll enjoy working with Freddie just as much as we do! Here's a little treat, a guest post and a look at the Indie Craft Parade team. Hi, guys. This is Mollie Greene and Annie Koelle, long time fans and friends of Indie Craft Parade. A couple of weeks ago we had a grand time dressing up and photographing the lovely ladies of the Indie Craft Parade in pretty vintage pieces that will be coming soon to our brand spankin' new Etsy shop, Free Kittens Vintage. These girls have great style already, so it wasn't hard to find good, classic pieces to add into their current wardrobes. We asked them to bring a great pair of jeans, leggings that can go with anything, good tights, favorite heels and boots, and belts or scarves that they felt wonderful wearing. We then talked about the looks we'd pulled for them and how they could work with the contemporary pieces that they'd brought along. We worked with them until they felt good in the clothes and talked about how and where certain pieces would be great to wear. Who doesn't love to dress up and feel great? We all had a super afternoon and can't wait to do it again. Indie Craft Parade Holiday Fair! ), so don't forget to stop by if you want to get your paws on some one of a kind, beautiful vintage pieces and to ask us for advice on how to mix vintage into your modern wardrobe. Mollie and Annie do an amazing job curating their vintage goods. Thanks to their fab stylings, we all want to incorporate more vintage wear into our wardrobe. 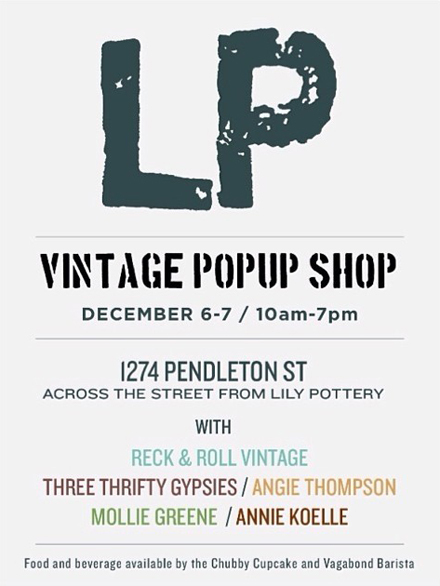 Make sure you stop in the pop-up shop this weekend, it's going to be grand! We're so glad to have Etsy as an Indie Craft Parade sponsor this year! The Handmade Marketplace has been helping designers and makers sell their goods online since 2005. Their site has also been extremely instrumental in helping the handmade movement gain traction. Earlier this year, our team got to visit their Brooklyn headquarters and it was just as awesome as we expected. Outside Etsy headquarters. Etsy shares our love for artists, so this weekend, they will join us alongside Spoonflower as a co-sponsor of our Artist Meet & Greet Breakfast. Etsy staff will be on hand throughout the weekend to conduct shop reviews and host a special educational workshop for our artists! If you're not familiar with Etsy, be sure to spend some time looking around their site. They offer quite a few resources and tools to help artists and to make it easier for people to find handmade goods. Some of our favorites are Shop Local, the Seller Handbook, and their blogs. Many of our participants sell their handmade goods on Etsy and we use a few of the Etsy tools (like treasuries) to share their items before the show. One of this year's Indie Craft Parade treasuries. If you want to know more about Etsy or get involved locally, be sure to check out the South Carolina Etsy Team. This is a great support group if you’re an Etsy seller or would like to be. 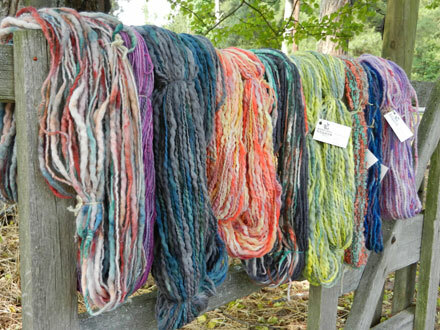 Online, the team posts great tips for selling and getting the most out of Etsy. You can join this team if you’re an artisan “living in South Carolina who maintain an Etsy shop containing a minimum of 5 items…and who participate in group discussions and/or activities” Visit their page for more details. 1. Bring a friend and meet us this Saturday at 10am in front of The Peace Center, at the corner of Main and Broad Streets. Together we'll cover downtown. 2. Take posters to another area, near or far. We could use your help reaching other parts of Greenville, or nearby cities. If you can help, posters will be available for pickup at Dapper Ink. 3. Download and print your own poster to hang at your desk, in your dorm room or your place of work! Or email it to friends and family members. 4. Spread the word with or without posters! 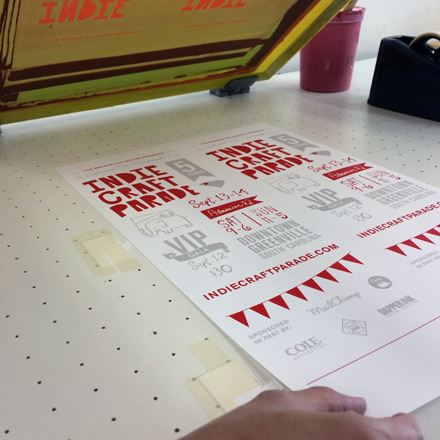 Tell everyone you know about Indie Craft Parade and the upcoming festival. PoWhen you see this year's posters, you'll notice another one of our wonderful sponsors, Graphics Now. Graphics Now has donated poster printing for us several years now, and they never fail to impress us with their quality and turnaround time. Whether it's local businesses like Graphics Now or our volunteers, we are incredibly grateful for the ongoing support of our organization and our mission. We couldn't do it without you! Earlier this year, we launched a brand new Indie Craft Parade website to replace the original site launched in 2010 — a lifetime ago in Internet years. From the beginning, we felt that the Indie Craft Parade brand should reflect the quality of work our artists are producing. We worked with local web designer Andrew Ramos and development company RoboJuice to create and launch a new site that would better accomplish this goal. Andrew helped us plan out how we could restructure and simplify, then worked through several iterations of our new design. He created a look for us that was fresh, functional and unique. Focusing on smaller blocks of content allows the site design to remain flexible and interesting as our needs change. The end result not only raises the bar, but it displays our information in a creative and original way that readers can engage with. 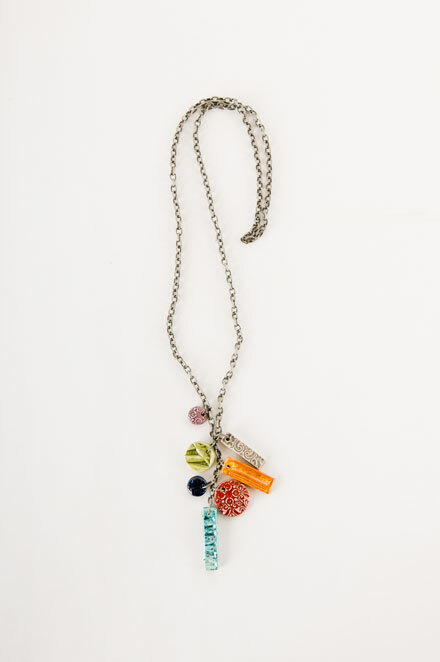 We love how it reflects the colorfulness and the spirit of Indie Craft Parade. The new design also allows us to showcase handcrafted elements, like original illustrations by Cory Godbey as well as photos and video of our past events. But the new design is just the first part of the process. Our next step was to find a developer who could make Andrew's design function beautifully. And that's where our new friends, Kevin and Jeff at Robojuice come in. Robojuice is focused on people and process. From their mission: The personal attention we give our clients is to help them flow through our process in order to meet their expectations. Web can be intimidating to some so we are very clear with clients about what we are doing, what we need to do it, how long it will take, what it is worth to them and what is the final outcome. We listen for the real challenge and respond with the proper digital solution - we are not about just delivering a dictated web product. We want clients to love web and love working on web initiatives. Hearing the words "partnership" and "trust" from our clients means we are on the right track. Robojuice gives attention to people and process so that clients enjoy and want to work on web initiatives. We couldn't agree more. Robojuice implemented our new design with an amazing attention to detail. And they even added some fun touches of their own to the mix (did you notice the TV static on our video? Their idea!). We loved that they were just as excited about our new design as we were! It's always a treat to work with people who not only love what they do, but are good at it. And this designer/developer team is no exception. We are so grateful for the time they contributed to bring our new site to life. Congrats, Jessica, commenter #6! You are the lucky winner of the signed copy of Furniture Makeovers and accompanying tote. We'll be emailing you shortly to arrange shipping your prize. (The winner was randomly chosen via Random.org.) To everyone else, don't despair! You can get your own copy of Barb Blair's Furniture Makeovers at Chronicle Books, or anywhere books are sold. We've got one more treat from Barb to share! This delightful little video lets you flip through the book, peek into the studio and shop, and showcases some of the refinishing techniques, complete with a stop-motion transformation of a piece of furniture. Such fun! 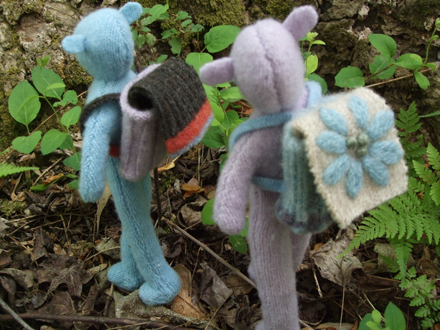 To see what Barb is working on, follow along at her blog. What piece of furniture do you want to makeover for your home? The closer we get to the main event, the more we want to tell you about the people who make the festival possible. Today, I want to share all the goodness of MailChimp with you. If you’re a business owner, event coordinator, or leader of any sort that handles a lot of group communication, MailChimp could be an indispensable tool for you. MailChimp describes themselves as a way to help you: design email newletters, share them on social networks, integrate with services you already use, and track your results. In short, they call themselves “your own personal publishing platform.” Besides keeping you and your followers organized, MailChimp provides beautiful design templates, loads of free advice and tutorials, and even ways to manage all of your features on the go. Best of all, you can get most of the MailChimp services for FREE! Their no-nonsence approach to mass communication combined with their fun personality and design make MailChimp a great tool for anybody. And on a personal note: We at Indie Craft Parade have used MailChimp to organize our newsletters and campaigns for the past few years, and we can't imagine using anyone else's services. Not only does MailChimp provide a great product that makes our lives so much easier, but also we love them because they truly care about the creative community that we're a part of. They've given amazing business advice to our followers through participating in The Makers Summit, they always provide an element of fun to the events they're part of (i.e., Freddie the Chimp hats), and they donate generously so Greenville can can continue to enjoy Indie Craft Parade. So please, if you're looking for a service that provides solutions such as MailChimp does, give them a try. We stand behind their product, and we know they're good people to do business with. Our media sponsors play a key role in helping us spread the word about Indie Craft Parade. Today, we're introducing one of these valuable partners: TOWN Magazine. What we love about TOWN is their focus on finding and showcasing Greenville's talent, whether it be in the realm of food, music or art. Flip through the most recent issue of TOWN and you'll read about Greenville makers, including several of our own Indie Craft Parade alumni. You'll also learn about the revitalization happening in Greenville's art district, new restaurants to try, and so many other things we love. TOWN helps highlight small businesses and entrepreneurs, and they do it well. Their focus on quality photography, layouts and writing make all the difference. In February, when we hosted The Makers Summit, we assembled gift baskets for our out of town speakers. We wanted to include a copy of TOWN alongside other Greenville goodies, to introduce our guests to Greenville. Until then, we didn't realize exactly how many other people love TOWN Magazine too! We had to visit three separate locations to find the handful of issues needed for our baskets. So next time you see a copy of TOWN, pick it up before it's gone! You'll be excited to learn about all the amazing things happening in Greenville, and you might just see someone you met at Indie Craft Parade! It's become an Indie Craft Parade tradition. One that lives long after our festival on refrigerators, cubicles, and in profile pictures across the Southeast. And it might be one of our favorite parts of the show. 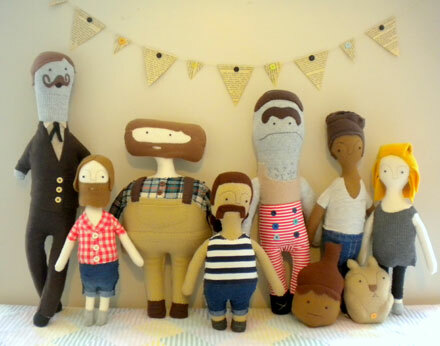 Since the very first Indie Craft Parade, Jon Monts at Oh Snap! has been a regular, helping our thousands of attendees take a few of their memories home. If you check out the new video on our website, you can even spot the booth in action. They’re another one of our fabulous event sponsors, and we’re so happy to have them back again this year. It's always fun to see how people use our props in the booth to capture the spirit of Indie Craft Parade. Oh Snap! has been so supportive of our event over the years, and we've been happy to recommend them to party planners, brides and anyone else who will listen. We think they're an important part of what makes Indie Craft Parade so great. Plus, their booth looks fantastic, just one of the reasons they stand out from the rest. If you have an event like a wedding or other party coming up, Oh Snap! Photobooth might be just the thing you need. IT'S OFFICIALLY FESTIVAL SEASON!! We're so excited! With the 2013 Indie Craft Parade just a couple of months away, we get to start introducing all of the people who make it possible--vendors, sponsors, even food providers and musicians. Once the applications close at the end of this month, we'll start giving sneak peeks to who will be joining us. But for now, we want to show a little sponsor love. 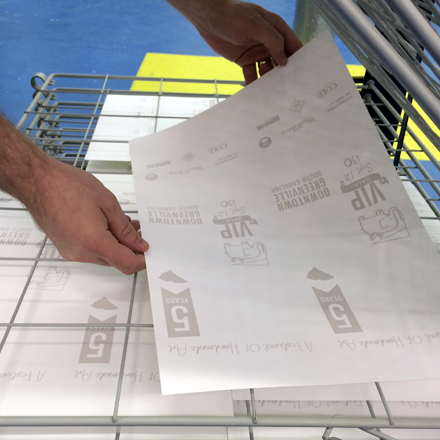 Today, we're sharing Dapper Ink--our go to business for local printing. For the past three years, Dapper Ink has been our source for tee shirt printing and more recently letterpress and banner printing. For the upcoming festival we're excited to announce that Dapper is partnering with us to run a print-your-own screen print and letterpress station (more details to come). And when you arrive at the festival you'll now know where the volunteer tees, directional banners, and other printed goods came from. Welcome to Dapper Ink. 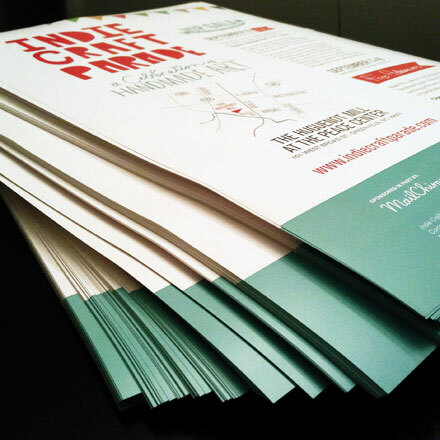 We're your one-stop-shop for all things print and design. Working since 2007 in the beautiful upstate of South Carolina, we serve our local and regional community by providing top notch artwork and printed goods. With small minimums and complimentary design services, we're the perfect source for providing apparel and accessories for schools, youth groups, small businesses, summer camps, and local events. We pride ourselves on creative designs, timely service, and great customer experiences. Almost all of our work is handled start to finish in-house, which guarantees our careful attention to detail throughout production. We have a great team at Dapper Ink. Staffed by artists, graphic designers, and print specialists, we're a creative place to work and do business. When not at the shop, you'll find us biking the Swamp Rabbit Trail, playing with our pets (we have a Dapper Dog! ), obsessing over new Apple products, getting lost in the Blue Ridge Mountains, or geeking out over foodie trends and the perfect cup of coffee. Each tee shirt is printed by hand. Dapper ink has a great shop location not far from Downtown Greenville. If you visit, you can also check out their collection of letterpress goods in the front studio. They have a 100 year old press that they use to produce greeting cards and post cards as well as custom work such as wedding invitations, birth announcements, and business cards. Thanks Dapper Ink for all your work for Indie Craft Parade!! Applications for the 2013 Indie Craft Parade: Stand out from the crowd! Each year, more talented artists are competing for the same number of Indie Craft Parade spots. The jury may change each year, but what they're looking for doesn't. As you prepare your applications, we wanted to share a few tips that could help you stand out from the crowd. Here are a few ways you can showcase your strengths in these areas with your application. Photography: This the primary method jury members use to determine the quality of your work. Two years ago, we did a short series about ways to improve your product photography. If you feel that your photos don't portray your work accurately, brush up on these basics or ask for tips from someone you know who takes great photos. Or let it have the spotlight. 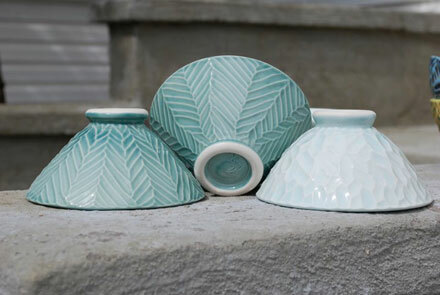 Photo: Lily PotteryThe vision of Indie Craft Parade: We are looking for the highest quality handmade goods in the realm of modern craft. The emphasis is on quality and modern. Experience and background aren't a deciding factor; if you create the most amazing handcrafted work, we don't care if you’ve been doing it for 30 years or 3 months, we want to see it! This isn't your grandma's church bazaar, not a place where you'll find "country crafts" or monogrammed tupperware. We feature modern craft; high quality work with a fresh and unique spin. Also, as a sidenote, if you typically participate in art shows, you already know you'll want to have a varied price range, with plenty of items that can be sold at an affordable price point. One of Indie Craft Parade's goals is to make art more accessible, which means the average price of goods sold at our festival maybe lower than other Fine Art shows. No matter how well made your items are, remember they need to be a good fit for the audience. That doesn't mean that all your products should be $20 or under, but just be aware that for our show, the more affordable items sell better. So bring those beautiful big ceramic vases or original framed paintings, but also have plenty of mugs or prints that are offered at a lower price point. Originality, Uniqueness and Innovation: You want your work to stand out from other applications, especially if you're entering a competitive category like To Wear. Our best advice is to show the jury something they haven't seen before. An item made with an unexpected material or color is going to catch the jury's eye a lot quicker than something they've seen a hundred times before. Also, our jury loves seeing a fresh, modern take on a traditional craft... like a dip-dyed woven basket or a carved wooden pedestal with clean lines. If you're afraid your product may get overlooked, consider other ways you can innovate, maybe with interesting packaging. Branding is something our jury considers, so a well-designed logo and packaging will certainly work in your favor. Quality: The jury is looking for signs of craftsmanship, so if an application is completed haphazardly — the description unclear or photos out of focus — this reflects poorly on your work. Take an extra minute to re-read what you've written and make sure you submitted the best photos. This extra attention will convey that you care about what you do. If you have tiny details that can be missed from far away, consider using one of your images for a close up shot that will show off your skills. We hope these tips help you put your best foot forward, and we can't wait to see all the submissions! You can apply online from June 1 to June 23. Are you an experienced exhibitor? Share your tips with us in the comment section! Look Ma, we're on TV! Just kidding! But we are on an episode of Smart Creative Women, a wonderful video interview series that the lovely Monica Lee hosts on her blog. Elizabeth and Erin, the 2 founders of Indie Craft Parade, get chatty about everything from the story behind the festival to what new adventures the future might hold. Who knew we could talk so much! Huge thanks to Monica for featuring Indie Craft Parade. Make sure you check out all the great stories shared on Smart Creative Women! Diane Kilgore-Condon is an artist based in Greenville, South Carolina, who creates imaginative oil paintings with a surrealist feel. She is member and founder of ArtBomb Studios, a collaborative and visionary studio space established twelve years ago in what is now Greenville's Art District. Diane is best known for her paintings and mixed media pieces as well as her great love for rescuing dogs. Marco Suarez is an artist and designer living in Atlanta, GA. Marco's artwork combines landscape photography with digital techniques that he has developed as a graphic designer. He creates digital collages incorporating photography, ink, watercolor, inkodye, and other textures and mediums. He is also the Art Director at MailChimp. As a designer, Barb specializes in redeeming found goods and furniture that inspires one-of-a-kind design stories. She is an avid lover of color and has a fresh eye for unpredictable combinations of style and texture. She also loves being behind the lens, carrying her camera everywhere. The art of capturing everyday beauty and detail strongly influences her design concepts. She is the author of Furniture Makeovers, published this spring by Chronicle Books. 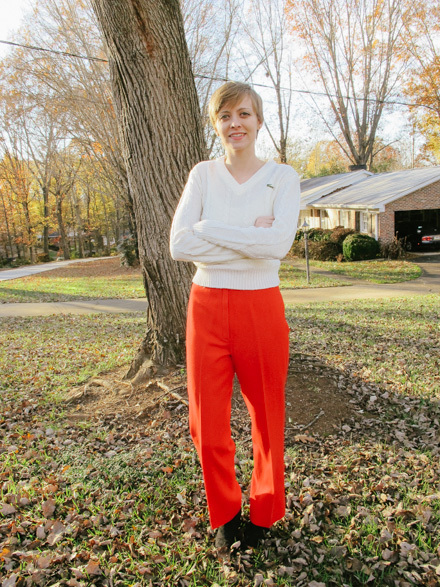 Teresa Roche is an artist, a gallery curator, and an interior designer. As an artist, she creates mixed media collages primarily working with thin layers of acrylic paint, vintage paper and fabric. Art & Light is Teresa’s fusion gallery/home accents boutique featuring local artists and mid-century modern furniture and lighting. Her particular knack in interior design is the use of re-worked, previously outdated, odd or unusual pieces (from industrial material to old signage or a clock piece! ), children’s art, the work of art students, etc. in order to maintain modest price points on furnishings and accessories. After completing a three-year residency at Penland School of Crafts in Penland, N.C., Daniel relocated to the Greenville area with his wife and children. Daniel has set up his shop and studio in the Old Southern Bleachery in Taylors, S.C., where he makes custom architectural work, sculpture, paintings, and objects for the home. June 1st is the date applications open, so tell your crafty friends and get your products and cameras ready to apply for the 2013 Indie Craft Parade! 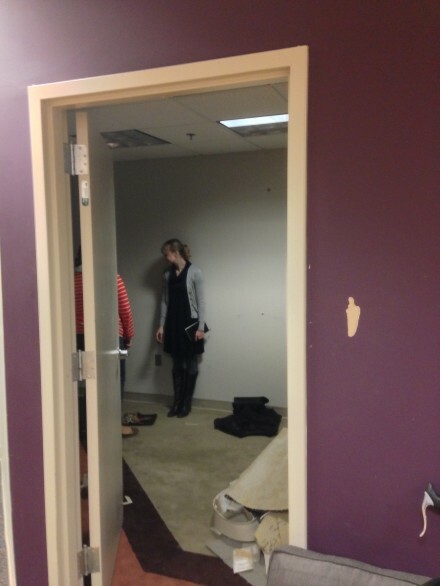 Indie Craft Parade is getting an office! Though we love our job, we sometimes feel as though Indie Craft Parade makes migrants out of us. Our collection of events throughout the year is organized from our living rooms, local coffee shops, or a corner in our respective workplaces. However, when we learned that there was space available at The Forge in Downtown Greenville (the newest endeavor of the Iron Yard), we jumped at the opportunity. The Forge is currently under construction/renovation, so they've offered to let us tackle our new office space from the ground up. This afternoon our team went to our future location to take measurements and draw a rough plan. Our little 135 square feet has a long way to go, but we think it's going to be an awesome space to work and dream when it's finished. 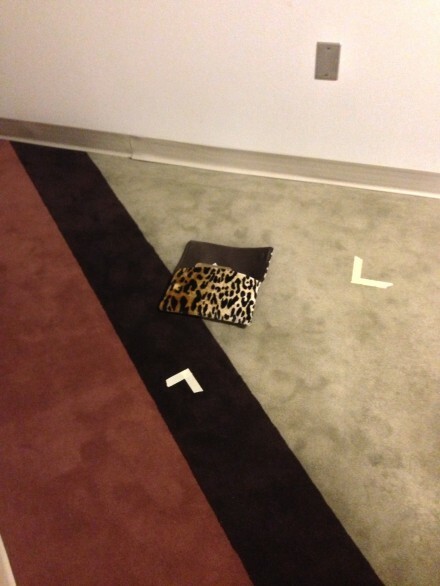 Check out this crazy carpet! And now for our vision of the space. Here's a glance at the inspiration for the new office. You can find these and lots more on our Pinterest Board! We love the clean white spaces with touches of color. Lovely craft organization and monochromatic wallpaper...but with ELEPHANTS! Chair and chalkboard, oh yes. No worries, we'll document the process as we go. You'll see us carry out a host of DIY projects we've been dreaming of. The closer we get to the The Makers Summit, the more we want to tell you about the people who make the meet-up possible. We have worked with and used the services of MailChimp since the beginning of Indie Craft Parade, and they have proved time and again to be an indispensable resource. MailChimp describes themselves as a way to help you: design email newletters, share them on social networks, integrate with services you already use, and track your results. In short, they call themselves “your own personal publishing platform.” Besides keeping you and your followers organized, MailChimp provides beautiful design templates, loads of free advice and tutorials, and even ways to manage all of your features on the go. Best of all, you can get most of the MailChimp services for FREE! Their no-nonsence approach to mass communication combined with their fun personality and great design make MailChimp a great tool for anybody. For The Makers Summit, not only has MailChimp shared their monetary support, but also they're sharing their staff. We are so, so excited to have Amy Ellis, the Head of Integrations and Partnerships at MailChimp, as one of our panelists. She is truly a girl after our own hearts. Besides helping people do awesome things with their businesses everyday, Amy is a regular speaker for crafty conferences, a foster parent for her neighborhood dogs, and an ardent fan of yarn bombing (so fun!). For The Makers Summit, Amy will be sharing her wealth of knowledge about email marketing. She understands how overwhelming it can be to step away from the hands-on projects to promote yourself, so we can't wait to hear loads of tips and practical advice from her at the conference. For a sneak peek of her genius, check out this interview as part of Unbounce's Conversation Heroes. Thank you again, MailChimp. We love working with you and so greatly appreciate everything you do for the making community. I've got a treat for you today. Of all the things people note about Indie Craft Parade, our mascot--Hugo--gets a lot of attention. Our adorable little elephant perfectly embodies the whimsical spirit of Indie Craft Parade, and we thought you might like to know a little more about him. With all of the indie craft fairs across the country, we worked tirelessly to make sure our name and branding stood apart. We labored over the name, and once we settled on Indie Craft Parade, it didn't take long to decide that we needed a mascot that could match our excitement about the event. An elephant was perfect: marching, leading our parade, like a fabulous circus. We named him Hugo, after the location of our event, the Huguenot Mill. Below are some of the many versions of Hugo that were drafted by the ever talented Cory Godbey. We thought you'd really enjoy seeing this.